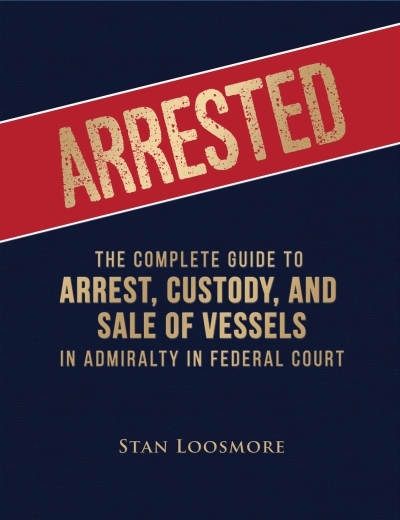 Arrested is the definitive practice guide to the unique Federal Court Admiralty procedures of vessel arrest, custody, and sale. It contains 87 Figures – sample pleadings and documents – every one of which is directly based on a pleading or document that has been actually used in a Federal Admiralty foreclosure case. Each Figure is annotated and is presented in a form which can be scanned and modified for use. In addition, full purchase of this Practice Guide includes password access to the publisher’s web site where all of the Figures are available for downloading in “pdf” form. With this practice guide, a lawyer with experience in Federal Court will be able to file, prosecute and complete a vessel arrest case with total confidence that it will be done efficiently and accurately.